Every time I view the sea, I feel a calming sense of security, as if visiting my ancestral home; I embark on a voyage of seeing. 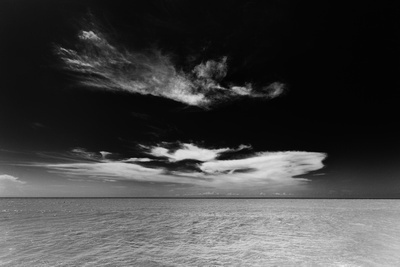 In 1980 Sugimoto began working on a series of Seascapes from around the world, he uses different exposure times (sometimes up to three hours) and he composes them with the horizon bisecting the photograph. Oh, he uses an old-fashioned large format camera to do this, serious stuff! Sugimoto I’m not, but his reflection on how the view of the sea affects him made me thing of all the times I’ve visited our own Seawall, and even when the tide is high and the waves are rough, there’s a sense of sereneness that permeates me, calms me and makes me forget my worries. His last phrase there also reminds me of how we often stand (or sit) and face the waters and stare out to sea, as if in a daydream, “on a voyage of seeing”. I won’t try to mimic his work, but the simplicity of his work made me wonder if I could try a simple seascape, something without the occasional boat or human element, or the rocks along a shore. This image was taken in the afternoon, and I processed it using Nik Silver Efex, with an orange filter for effect. Click on the image for a better view in the Gallery, along with others in the Black and White series. I think you went in your own direction there Mike, and the photo is the better for it. Being inspired by someone is good. Copying, not so much.